1. Fox Creek Inn, located in Victor and managed by John & Ellen Christenson. They have been interim innkeepers at this 4 room inn for 2 1/2 years. During their tenure, they achieved the honor of becoming a number one listing on Trip Advisor in the city of Victor. When they took over in December of 2013, there were no reservations on the books. 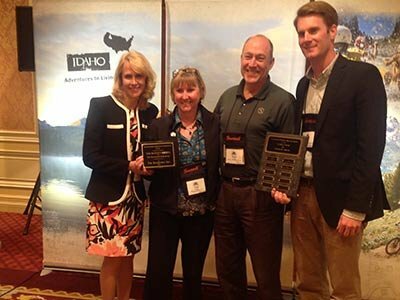 By creating a presence on the Idaho B&B Association site, Expedia, Booking.com, and by becoming a Trip Advisor Business Partner, by February of 2014 they were receiving reservations and by that summer, they were booked for 49 straight days. They have a perfect score of 5.0 with over 120 reviews on Trip Advisor. Their strong desire to see the owners succeed in the small lodging industry is obvious! Bonzey Award Recipients: Seated L-R Sister Corrine Forsman & Sister Chanelle Schuler from the Inn At St. Gertrude in Cottonwood; Janice Schoonover & Roley Schoonover from Western Pleasure Guest Ranch in Sandpoint. Standing L-R Peggy & Grant Griffin, Frank Halter: Volunteers at the Inn At St. Gertrude. Matt Borud, Business Development Officer ID State Dept. Of Commerce. 2. The Gooding Hotel Bed and Breakfast, located in Gooding, is owned and operated by Dean and Judee Gooding. The B&B is the oldest remaining original building in town. The Gooding's purchased the property in 1980, preserving the history of the Gooding family. Some of the original historic material centers around Frank Gooding, who served two, 2year terms, as Idaho's 6th Governor. Dean & Judee, the current owners, have remodeled the building and in 1986 received the designation of being listed in the National Register of Historic Places. They have become the preservers of history in their small community! 3. The Grey House Inn, located in Salmon, is owned and operated by Dave and Sharon Osgood. Built in 1894, this Victorian serves as a vacationer's retreat in the Frank Church Wilderness & it is just a short walk to the Salmon River from their backyard. They not only run the inn, which includes the main house, 2 cabins and a carriage house, but also serve as guides on fishing and whitewater rafting tours on the "River of No Return." They were some of the first B&B's to partner with outfitters and guides in the area, like Kookaburra professional Rafting and Fishing Trips and Rawhide Outfitters trail riding. Their partnerships with others that offer outdoor activities, provide their guests with memorable experiences, while at the same time helping other businesses in the community. 4. Heartland Inn, located in New Meadows, is owned and operated by Steve and JoBeth Mehen. Their 21 year ownership of the historic 1911 building, puts them near the top for years of service in our industry. The ground floor of the inn features the Stein and Stirrup beer and wine bar. They not only have a bed and breakfast with 4 rooms and a bar, but also operate a motel with 11 rooms and a vacation rental. Their dedication to providing a variety of small lodging to the tourism industry for the past 21 years is remarkable. 5. Inn at St. Gertrude, built in 1924, located in Cottonwood, is operated by the Benedictine Sisters of the Monastery of St. Gertrude with Innkeepers, Sister Corinne Forsman and Sister Chanelle Schuler. The Inn was opened in 2010 as an expression of their core values: healing, hospitality, grateful simplicity and creative peace making. This unique property has a variety of special areas on the grounds, the Monastery itself, The Historical Museum, a Gift Store, Healing Center and large garden featuring raspberries served at the annual Raspberry Festival held each August. Their monthly newsletter is phenomenal and the effort they put into making hospitality a core value is obvious the moment you step foot on the property! The sisters would like to personally thank their volunteers Regina Sullivan, Lisa Radakovich, who helped with the design of the inn Peggy and Grant Griffin, and Frank Halter for helping share the Benedictine hospitality. 6. Lion's Gate Manor, located in Lava Hot Springs, is owned and operated by John and Tami Clark. They provide 8 guest rooms and a mineral spa in addition to a real military themed campground for couples, families and groups. Their creative marketing of this campground style part of their B&B shows extra effort often required to sustain a business plan. They truly think outside the box. 7. Western Pleasure Guest Ranch, located in Sandpoint, is owned and operated by Janice and Roley Schoonover. They provide family or group retreats, horse back riding, sleigh rides, & all inclusive guest ranch vacations. Instead of "Meet The Hosts" commonly found on most websites, they have "Meet The Horses!" From a very small one bedroom house under 3 feet of snow on a cold February 14 in 1940, came the start of what is known today as "Western Pleasure Guest Ranch." It has grown through 3 generations of family members working the 960 acres, from a one bedroom home, to a 10,000 square foot log lodge with 6 guest rooms and several cabins. They are involved in the National Guest Ranch Association, North Idaho B&B Association and the Idaho B&B Association. They are a wealth of information for marketing and operating an authentic Northwestern experience. 8. Wylie Lauder House, located in Moscow, is owned and operated by Otto & Barbie Keyes. The House was originally constructed and built by Wylie Lauder, who owned the first brick making business in the area. Otto & Barbie purchased the home in 2002, then renovated and opened it as a B&B in 2004. As former employees of U of I, they realized the value of marketing their business in an area that would provide a natural clientele. Otto roasts his own coffee for the inn, red-FINN, which is quite popular with guests, and provides another avenue for his creativity as an innkeeper. Ranked #1 on Trip Advisor in the Moscow area, they are currently active in helping to form a North Central B&B Association. And of course, if you read the Summer Newsletter, you know the winners were the Inn At St. Gertrude, and Western Pleasure Guest Ranch! May 5-7, 2015 took us to our state capitol, Boise. With the hub of business as our backdrop, there was no way of having anything except an informative and productive 3 day conference. 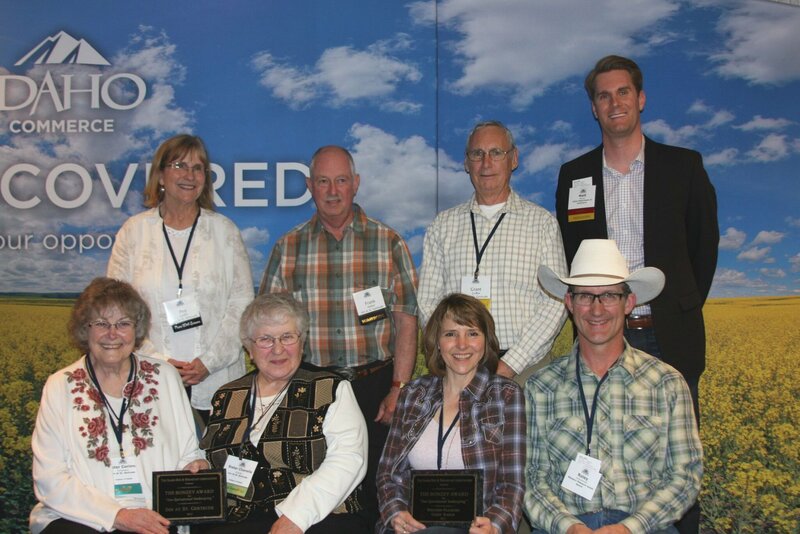 Plus, the Idaho Bed and Breakfast was a proud part of the Governor's Awards Banquet. 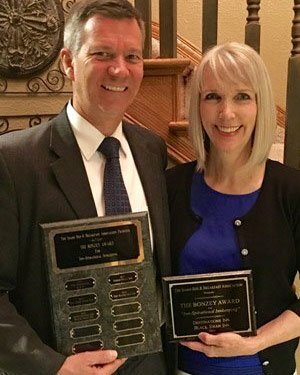 Through our nomination process, the IBBA Board Members were happy to introduce and announce our "Bonzey Award" winners, Larry and Debbie Fisher, owners of The Black Swan Inn located in Pocatello and Destinations Inn located in Idaho Falls. Their dedication to helping others, amazing community involvement and the building of their unique business model and brand, makes them the perfect choice for this year's Bonzey Award recipients. Larry was also awarded the Business of the Year by the Small Business Development Center. His two inns, one in Pocatello, The Black Swan and one in Idaho Falls, Destinations Inn are both transformed properties. Starting in 1997 with a 10 unit apartment building and utilizing his knowledge of the construction field (as founder and owner of Fisher Construction,) this amazing couple began the transformations. Debbie’s artistic ability is reflected in the countless murals, sculptures, bedroom sets and drapery found in every room. Each room is unique and amazing in the fine details you will find that represent a myriad of countries and items from around the world. You can tell from their mission statement, where they state that they want to exceed their guests expectations in all areas of their service, that they are focused on their business goals! Larry & Debbie Fisher, owners Black Swan & Destinations Inn Bed and Breakfasts. The Idaho Bed and Breakfast Association annual conference was held in Sun Valley Idaho in conjunction with the Idaho Conference on Recreation & Tourism on May 6-7-8. The theme "Together Toward Tomorrow" was evident in the Longwood's International Research report delivered at the conference. The report focused on Idaho and contained valuable information that will be highlighted in our next newsletter. This year's "Bonzey Award for Inn-Spirational Innkeeper" was given to John & Tina Hough of the Roosevelt Inn in Coeur d'Alene. This couple has given time above and beyond to the IBBA group by staffing the show booths at Utah, Calgary & Seattle for the last 2 years and countless tasks associated with board membership in the organization. The Wednesday evening reception was co-sponsored this year by IBBA, Idaho Restaurant and Lodging Association, Idaho Outfitters & Guides, Idaho RV Campground Associations, and Ski Area Association. Each group contributed gift items for baskets that were given out at the luncheon the following afternoon. We enjoyed seeing our members at the event and hope next year will find many more of you in attendance in Boise. What a great conference again this year. The ICORT Conference, once again, was our meeting site. As usual, great speakers, 30 industry vendors and an overload of info for attendees. Breakout sessions galore! Subjects ranged from "Making the Web Work for You" to "Be Unforgettable in Hospitality". The association highlight was being able to honor Francis Conklin of Dog Bark Park in Cottonwood, Idaho with our "Bonzey Award" for the most "Inspirational Innkeeper" of the year. We wish all o2013 Idaho Conference winnerf our decisions were this easy to make. 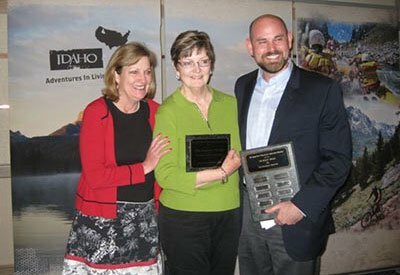 Her dedicated service on the Idaho Travel Council (2 terms) and her community involvement, sets her apart from the rest. Also, 12 years in the Bed and Breakfast industry made her a very deserving recipient. Make your plans early for next year. The IBBA conference will be held in beautiful Sun Valley. See you there. The 25th Annual ICORT conference held in Coeur d’Alene in May of 2012 was a big success. It was our first IBBA conference to be held in conjunction with the Idaho Conference on Recreation and Tourism. Our partnership with them led to the procurement of two outstanding featured speakers, Jay Karen, PAII CEO & President, and Tim Brady, owner of Forty Putney Road B&B in Vermont. Their sessions were well received! Our involvement also led to the procurement of several vendors that represented our industry at the conference. We are looking forward to our future roles with ICORT. While Jay was in Coeur d’Alene he also met with a small group of our inn-keepers at a dessert held at the Roosevelt Inn. Big thanks to our members who donated room space for our speakers and vendors. Our presentation to the Idaho Travel Council at ICORT requesting funding for 2012-13 was a hit, and in the words of Diane Newman, ICORT Council Member from the South Central Region, "You have hit a Grand Slam!” with your presentation and with the new IBBA brochure!" At the conclusion of the presentation, the Idaho B&B Association was presented with a ribbon and certificate awarding us for designing and producing the top brochure for grant recipients in the state of Idaho. "Seventeen years ago, an energetic couple found themselves on the upper portion of the Clearwater River surrounded by forest, and turned a rustic sportsman's hangout into a beautiful & serene bed & breakfast inn that attracts visitors from far & wide. Also noteworthy has been their 17 year commitment to not only the Inn, but also the economic viability of the area, through their community involvement & long-range vision. They are good industry partners realizing success involves more than guests entering their inn. They share their vast knowledge of the area's history, and match their guests with appropriate activities and experiences while in Idaho. If that means referrals to other inns or businesses, they are most generous to do so. They also wholeheartedly believe in the value of industry involvement via the Idaho Bed and Breakfast Association, the Professional Association of Innkeepers International, and Idaho Tourism in all its facets." Wow! What a wonderful evening! Seventy five people, including ten professional vendors with their great products. Our speakers did an outstanding job. We really learned so much about the Idaho Travel Council grant process and the 2% bed tax from Frances Conklin. She is the ITC Vice Chair, representing the North Central Region, and owner of Dog Bark Park Bed & Breakfast in Cottonwood, Idaho. The tapas, beverages, birthday cakes were fabulous. 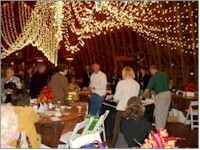 The silent auctions and raffles were a real hit. But—- they were just a few of the many highlights of the evening! 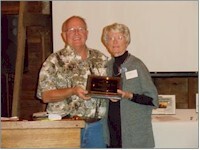 Betty Bonzey of the former “Ponderosa Bed & Breakfast” was present to receive the “Inn-Spirational Inn-keeper Award”. 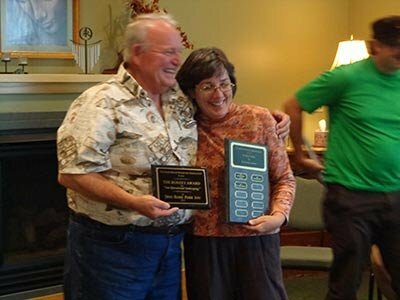 Betty accepted this award for herself and her husband Jack, who have retired from their 13 year career as innkeepers. Their exceptional career has been an inspiration to all that have been fortunate enough to know them. This award will be given out in their name at all future Idaho Bed & Breakfast conventions, to the outstanding innkeeper of the year. This is a perpetual award, we will be accepting nominations for that award throughout August and September of 2011. Thanks to all and see you next year! IBBA President, Brian Scott, presents Betty Bonsey with the “Inn-Spirational Innkeeper” award. 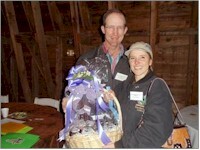 Janice and Rollie Schoonover, owners of Western Pleasure Guest Ranch in Sandpoint, were the lucky winners of the Huckleberry Specialties basket, donated by The Greenbriar Inn of Coeur d’Alene. An evening of socializing, fun, food and education! Big thanks to all that made this evening at Settler’s Creek event facility possible!